As a landscape painter primarily, I seek to find the subtle nuances; the color, light and shapes that help create a sense of place. Capturing the mood and heartbeat of the land, as I experience it, is important to me. My focus has been painting the Central Coast landscape as it is today. While I don't paint to record, many of my painting sites have changed or are already a memory. My goal is to create paintings that honor my subject and create a space that others can visit. Elizabeth "Libby" Tolley is an American Painter and Author. She is a fourth-generation Californian. 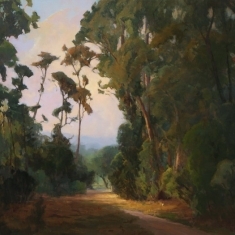 Painting the rural landscapes of California's Central Coast has been her focus. The artist brings these California scenes into the national spotlight, as her paintings have been selected for inclusion in art magazines, books, and national exhibits. In 2007, Libby completed an instructional book on painting landscapes called, Oil Painter's Solution Book: Landscapes, 100 answers to you oil painting questions. The book, published by North Light Books, answers questions students have asked over the years, and illustrates the process of painting both on location and in the studio. The book has been well received by artists in all mediums. In May 2012 the 3rd printing will be released with 30,000 copies sold. Libby has been featured in over 25 articles in international art magazines including, The Artist (UK), Southwest Art, Plein Air Magazine, The Artist's Magazine, and International Artist Magazine. Libby's paintings have graced three magaxine covers. 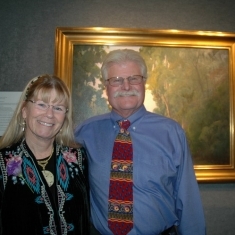 San Diego Flora, another book released in 2007, included her paintings "Morning on the San Mateo" and "Afternoon on the San Mateo." 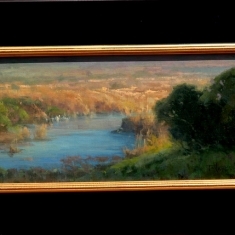 "Morning on the San Mateo" was exhibited in the Capistrano Light Exhibit sponsored by The Irvine Museum. Libby's work has benefited diverse groups such as: many land conservancies, Perinatal Substance Abuse Program and Casa, Friends of Hearst Castle, and the San Luis Obispo Mozart Festival. Libby's original paintings, as well as reproductions of her work, can be found across the country. Currently she has pieces on display in both the capitol buildings in Sacramento, California, and in Washington, D.C., and office of U.S. Congresswoman Lois Capps.